황남대총 북분 금제 고배(皇南大塚北墳 金製高杯)는 경주시 황남동 미추왕릉 지구에 있는 삼국시대 신라 무덤인 황남대총에서 발견된 굽다리 접시(고배)이다. 황남대총은 2개의 봉분이 남·북으로 표주박 모양으로 붙어 있다. 높이 10㎝, 주둥이 지름 10㎝, 무게 169g의 금제 굽다리 접시는 북쪽 무덤에서 발견되었다. 토기 굽다리 접시의 형식을 따라 반구형 몸통 밑에 나팔형 굽다리를 붙인 전형적인 양식이지만, 장식이 가해지고, 금으로 만들었다는 점에서 실용품이라기 보다는 껴묻거리(부장품)로 제작된 듯하다. 아가리 부분은 밖으로 말아 붙였고, 나뭇잎 모양 장식 7개를 2개의 구멍을 통하여 금실로 꿰어 달았다. 굽다리는 작은 편으로 상·하 2단으로 되어 있는데, 각각 사각형 모양의 창을 어긋나게 뚫어서 장식하는 신라 굽다리 접시의 형식을 하고 있다. 일부가 찌그러져 손상이 있으나 발견된 경우가 드문 금제 굽다리 접시의 귀중한 예이다. 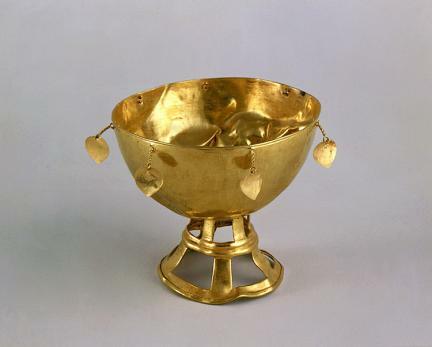 This gold cup with curved legs was found in the north mound of Gyeongju tumulus No. 98, Hwangnam Great Tumulus. It is 10 cm high, weighs 169g, and the diameter of the rim is 10cm. It is made after the style of a typical clay cup with its hemispheric shape and curved legs shaped like a trumpet. However, unlike clay cups that served practical purposes, this cup is made of gold and decorated. This indicates that it was made for the purpose of being buried with the dead body and not for everyday use. The rim is curved and rolled outwards and there are seven leaf-shaped ornaments threaded on a thin gold chain through two holes. The foot follows the general style of cups in the Silla Era. It is rather small and consists of two parts, the upper and the lower. Each part has a frame with big square holes. The holes of the upper part and the lower part are made to crisscross. Although it is crushed in many parts, it is a very rarely found kind of cup. Hwangnam Great Tumulus is a Silla tumulus located in Hwangnam-dong, Gyeongju, Gyeongsangbuk-do. The Gyeongju Tumuli serial number is Hwangnam-dong Tumulus no 98. It was excavated and researched by the Office of Cultural Assets in 1973 and 1975, and named Hwangnam Great Tumulus. Today the outward form of the tumulus can be seen in its restored form. Two mounds connected north and south give it the shape of a small gourd. It is the largest mound from the Silla Period.